I don’t get those people who don’t eat leftovers. Do you know anyone like that? (Or worse yet, are you one of those people??) I know I’m a food blogger, so I usually enjoy cooking. However, there are those days weeks (anyone??) when I don’t feel like cooking. It’s nice to know then, that I can rely on leftovers for at least one meal a day. These pancakes are yummy. Obviously. Otherwise, why would I be sharing them with you? The truth is, although I have been making these pancakes for a while (and even already have them written on a little recipe card. Yes, I still use the ‘ol recipe card filing system. ), the pancakes are so yummy that I have never gotten around to taking pictures of them for you. They are always gone too fast! This time though, I was tricky. I made a double batch, so I would have plenty leftover to take pictures with. Besides, I looove having leftover pancakes. We just stick them in our freezer, and voila! you have a fresh, hot, no-mess meal for breakfast one morning. 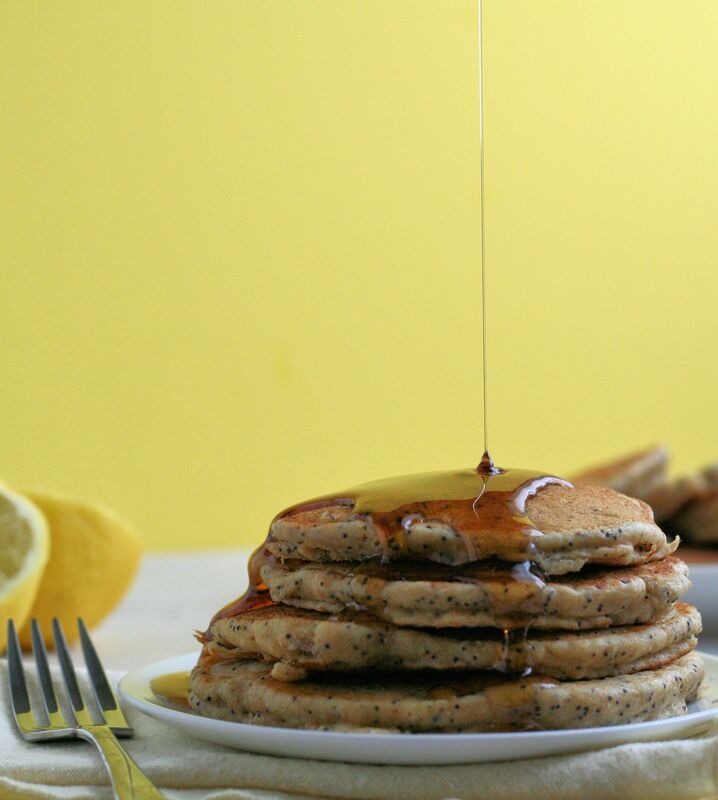 I’ve always been a fan of lemon poppy seed anything, so these pancakes are definitely up there with my all-time favorites. I love the lemon flavor that the juice and lemon zest add (feel free to add more zest for a more lemon-y kick). And the poppy seeds are just plain fun. Have yourself a sunshine-y breakfast! In a large bowl, whisk together flour, baking powder, and salt. In a small bowl, combine sugar and lemon zest. Rub together between fingers until you can smell that the sugar is infused with the lemon. Stir mixture into dry ingredients. Add poppy seeds and stir til combined. In another large bowl, combine yogurt, milk, lemon juice, eggs, oil, and vanilla extract. Stir til well blended. Add to the dry ingredients and stir just until combined. Heat a non stick frying pan (I use a flat one) over medium on stove or an electric griddle to around 350° – 375°. (Add a little bit of oil to be doubly sure it won’t stick!) Once hot, drop about 1/4 cup full of pancake mix for each pancake onto the griddle. Cook for several minutes or until you notice the edges are bubbling; flip to the other side and cook for another minute or so. Serve hot! *If you’re asking how to get lemon zest, simply use a microplane grater on the outside of the peel to “zest” it. The gratings are what you use for this recipe. These pancakes look very yummy. I have never tried pancake with lemon, interesting. Thank you for sharing, we love pancakes! Those look fantastic! I remember one time telling a childhood friend of my husbands that I didn’t feel like cooking dinner and he was amazed. “But, you guys always have great food And you have a food blog even.” I told him the food doesn’t magically appear in my kitchen and sometimes I don’t feel like going in and making the magic happen. We all have our days when the kitchen is closed and we don’t feel like opening it up…luckily that doesn’t happen all the time though. 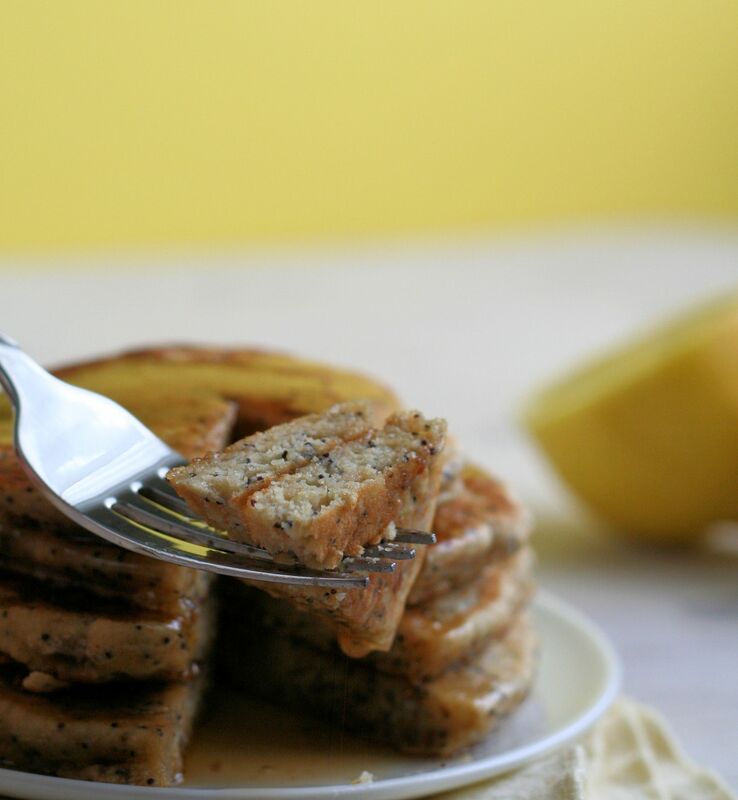 Ooo I love lemon poppyseed anything too! Looks great! Thanks! Ps. Love your blog – I’ve read it on and off for over a year now! Thanks Nicky! Lemon and Poppy seed are good in anything :)Thanks for the invite to Creative Wednesdays! Thanks Amy! I guess I had to eat my words because yesterday we were heating up leftovers (from a meal I really liked the first time) and I just couldn’t eat them leftover and ended up making boxed macaroni and cheese just to not have to eat the leftovers!! I guess there’s a leftover-hater in all of us!